Are you looking for an elite acoustic guitar? If you are, you certainly know that when it comes to elite guitar brands Taylor Guitars are one of the first brands that comes to mind. Taylor is known for their ability to provide high quality acoustic guitars for a wide range of customers and with the utmost value. But in addition to this, Taylor also has some of the most sought after custom guitars on the market today. Taylor Custom Guitars are a culmination of Taylor's unique craftsmanship, innovation, and ability to combine brilliant tone woods and aesthetics into a truly one-of-a-kind instrument. 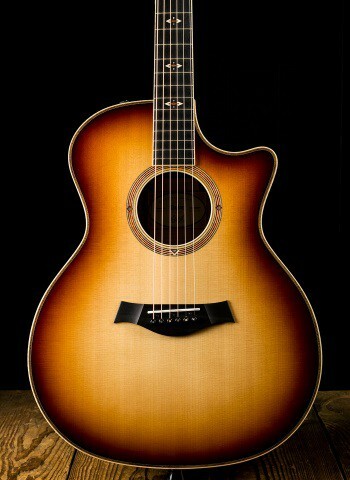 For one of the best selections of Taylor Custom Guitars contact us today at N Stuff Music. This is what has made Taylor Custom Guitars a premier manufacturer of the best acoustic guitars available. N Stuff Music is one of the premier dealers of Taylor instruments in the entire region. Guitarists everywhere know they can rely on us to have a wide selection of high-end Taylor guitars and that they will surely find an instrument that perks their interest. Our selection of Taylor Custom Guitars will surely give you the chance to try and purchase a brilliant Taylor instrument that will be practically unavailable at any other music retail store. As a Taylor Guitars dealer you can actually contact us at N Stuff Music or visit our store and build your very own Taylor Custom instrument. You can then build from a list of Taylor features, woods, designs, styles, and other options, your dream Taylor Guitar to the exact specifications that will make it the perfect instrument for you to use. Taylor's Custom Shop features some of the very best acoustic guitars that you can purchase on the market today. These guitars utilize Taylor's ability to make some of the most playable acoustic guitars will brilliant electronics and tone woods. At N Stuff Music we try to select custom shop guitars that will not only combine elements of what you expect from Taylor Guitars, but also instruments that are unique for Taylor and contain new innovations or designs that make them unique to the rest of the Taylor line. Are you interested to hear these Taylor guitars in action? Come visit us at our Store's location and let us know which Taylor's you'd like to demo and we will gladly get you set up and demoing Taylors so you can figure out what suits you best. Or check out our Youtube demos on many of the different varieties of Taylor guitars that we have readily available in stock. At N Stuff Music we are a premier Taylor Guitar dealer and are happy to show you our brilliant selection. Our customer service is second to none due to our mission to consistently provide the utmost value to the customer. Each guitar is thoroughly setup upon its arrival and your purchase so we can ensure that they are consistently performing at their best and will be sure to have longevity for you in the music world.